China has signalled its readiness to accept Korean reunification and is privately distancing itself from the North Korean regime, according to leaked US embassy cables that reveal senior Beijing figures regard their official ally as a "spoiled child". News of the Chinese shift comes at a crucial juncture after the North's artillery bombardment of a South Korean island last week that killed four people and led both sides to threaten war. China has refused to condemn the North Korean action. But today Beijing appeared to bow to US pressure to help bring about a diplomatic solution, calling for "emergency consultations" and inviting a senior North Korean official to Beijing. 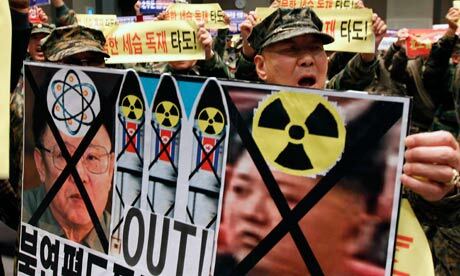 China is sharply critical of US pressure tactics towards North Korea and wants a resumption of the six-party nuclear disarmament talks. But the Guardian can reveal Beijing's frustration with Pyongyang has grown since its missile and nuclear tests last year, worries about the economic impact of regional instability, and fears that the death of the dictator, Kim Jong-il, could spark a succession struggle. China's moves to distance itself from Kim are revealed in the latest tranche of leaked US embassy cables published by the Guardian and four international newspapers. Tonight, the US secretary of state, Hillary Clinton, said the US "deeply regrets" the release of the material by WikiLeaks. They were an "attack on the international community", she said. "It puts people's lives in danger, threatens our national security and undermines efforts to work with other countries to solve shared problems," she told reporters at the state department.